Today’s patch should hopefully be a step in the right direction to fixing the issues on Ilum. Let’s hope so. Many of us follow the Dev posts daily and I have to say that yesterday’s post from Stephen Reid was some of the best news I have seen. Bioware has heard the community and is working to get a character copy for the Public Test Server. You can read below the entire post below in Dev notes section. Yes there are no exact dates yet, but all I can say is finally! The more high level characters that can test new updates, the better this game will be. Thank you Bioware for listening to the community…Okay enough praise get back to work, as the rest of us prepare to make the Jump. StephenReid General Discussion -> Poll: What do you think about the new changes made to global cooldown UI in 1.1.2? Hey everyone, thank you to all of you who gave constructive feedback here. We’ve closed the poll as we feel we have a good indication of your opinions. As I said previously, changes will be made to the global cooldown and we’ll bring you more information when we have a solid timeline to share. Possibly more than any part of the game, UI is a very subjective topic, so we understand the varied opinions expressed here. The long-term aim for The Old Republic is to give players flexibility in their UI choices and the changes coming for Game Update 1.2 will allow for more of that. I wanted to also address concerns about the Public Test Server. We’re working towards enabling character transfers so you can move your own character across and test new patches. Other ideas to allow the testing of high-level content have been explored, but ultimately character transfer is what we want to allow for everyone. Killing players on Ilum will now consistently grant Valor and mission credit as intended. PatrickMalott Crew Skills -> Is RE broke? The reverse engineering return rate is not currently working as intended. In an upcoming patch, we are improving the reverse engineering rates – especially for the higher-level items. We are also looking into the issue where a player receives “You already know that schematic” instead of learning a new research variation. Looks like for now, it might be a time to sell your crafted items or wait to RE them after a fix for this issue is published. I am level 265 in artifice and until I read this was not having any issues with RE’ing items and getting new schematics. Hopefully not many of have had to experience this issue. In our new series of “Quick Start Guides,” Star Wars™: The Old Republic™ Social Media Coordinator Eric Musco helps new players to better understand certain aspects of the game. The first installment in this series, “Begin Your Journey,” will guide players through the process of creating your first characters. Check out former member of TOROcast, Musco as he narrates this Quick Start Guide video. Hello and welcome to the official Q&A thread for questions to be answered for the February 10th, 2012 Q&A blog post. As a reminder, we’ll be starting up a weekly Q&A blog series in which we will select ten questions from the community and post answers to them every Friday. We’ll have our first set of answers next week on February 10th, 2012, but before that, we need your questions! Please use this thread to ask your questions (one per community member, so make it count!). On Tuesday at 2PM CST (8PM GMT), we will close this thread, select ten questions, and get answers to them for Friday’s blog post. 1) Keep your question relatively short. Background details are welcome, but don’t go overboard. 2) Please actually ask a question. We want to hear constructive feedback elsewhere in the Forums. 3) Use common sense – we cannot answer everything, especially on far-reaching content. 4) Limit yourself to one question in this thread, please. You can always ask another question next week! 5) And finally, as a reminder, this is not a discussion thread. Do not comment about what somebody else has posted. Any other posts apart from questions in the thread will be removed. With that being said, please ask away! Another week has passed and if you have missed any of your favorite CRR articles, don’t worry we have them all right here for your “one stop clicking” convenience listed below. Please take some time and leave your comments for our writers and let us know what you think or even what you would like us to cover in future articles. This week for our video tip, we check out TORHangout’s channel on Youtube. 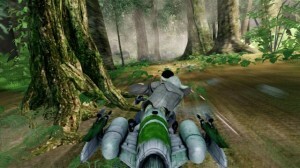 He has several short and helpful video tips for various topics in SWTOR. His first tip talks about how to set a Focus Target and your Focus Target Modifier. This seems like it could be very helpful for players that are healers and set their focus on the tank. Be sure to check out his channel for other SWTOR tip videos. Tune into AOTS & see martial artist, Ray Park turned actor talk about Star Wars: The Phantom Menace being released in 3D starting this Friday. The show airs at 7 pm EST. Yes, I know that even 3D will not improve the Jar Jar Binks character, but if ever a film franchise was suited for 3D it would be Star Wars. Do you plan on going to see it in 3D? Let us know in our comments below. 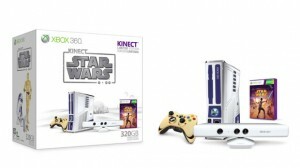 Before last Christmas, Xbox 360 and Lucasarts were to release a special Star Wars themed console and the Kinect Star Wars game. Due to delays the launch was postponed. Now, according to Brier Dudley in his blog featured in the Seattle Times, the game and Xbox 360 bundle will be released April 3rd, 2012. The console bundled with the game sells for $449.99. It is a bit steep, as you can see by the picture it looks beautiful. I have seen footage of the console and the console itself has the colors and details like R2-D2, but it also makes sounds like the feisty droid. The controller that comes with the system is metallic gold just like the other beloved Star Wars droid, C3-PO. Brier goes on to talk about the various game modes available in the game. The modes range from a “Galactic Dance Off”, podracing, another called “Rancor Rampage” and of course a lightsaber dueling mode. The game seems to have a bit of something for everyone. 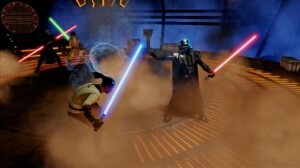 Hey, we all have pretended to have lightsaber duels growing up right? This Kinect game is going to allow us to do that again without breaking mom’s lamp. Below are some screenshots from the game in Brier Dudley’s blog. Do you have something to share with the SWTOR community? If so we would like to help share your original SWTOR work. Just send your in-game footage, music video, video parody, game tips, fan fiction, creative artwork… As long as it’s related to SWTOR the possibilities are endless – NO SPOILERS, Please. Send any of these my way to get highlighted in future HoloNet Links articles. You can email me at jason@corellianrun.com, or you can leave link suggestions in the comments below, or in the Facebook group. See you all next week! Episode 46: First Guild Summit and More So, You Think You Can Fly.